Please welcome author Lisa Duffy to the Tall Poppy Blog! She was kind enough to answer some questions for us to give us a look behind the scenes in the writing of THE SALT HOUSE. Talk abou t one book that made an impact on you. Breathing Lessons by Anne Tyler is a favorite, and a novel I reread at least once a year and find new things I love about it. 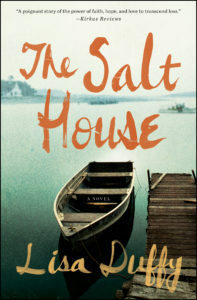 Where did the idea for your debut, THE SALT HOUSE, come from? The novel started as an exercise in setting for a creative writing class. I had this short piece about a woman lying in bed next to her child with a snowstorm raging outside in a small New England town. There was a sense of loss in the piece, but nothing specific. When I started to write more, the first four chapters came pretty quickly, told in four alternating perspectives. I knew then it was going to be a novel about a tragedy involving that child and told from each member of the family. What’s your favorite time to write and do you have any writing quirks, because, you know, inquiring minds? My favorite writing time is when I can dive in while still on that second cup of coffee in the morning after the kids are off to school. I don’t know if it’s a writing quirk, but my desk is next to a window and I like to shut the curtains before I write. I like the room dark and quiet, and free of the distraction of what’s going on outside. What’s one thing that’s making you happy right now? My oldest just graduated high school and is heading to college, and her younger brother and sister are realizing she’s not going to beright down the hall, and they’re all being extra nice to each other lately because of this. That’s making me very happy. What is the best perk of this writing gig? Hearing from readers who connected with something in the book. That’s an amazing feeling. What have you learned about yourself during the writing and publishing process? That every single writer, every one of us, hates the waiting aspect of this business. Whether it’s waiting on the craft aspect of it, putting in the hours of writing time and waiting for your manuscript to come together into something cohesive, or waiting on any number of things in the publishing industry…it’s just part of this writing life and this business. And it can become a bit paralyzing if you let it. My debut process taught me that. I spent a lot of time stressing about things that were completely out of my control. I’m more aware now of where I’m focusing my energy and attention, and I try to just let the rest of it unfold as it will. Can you talk about what you’re working on next? I’m working on a multigenerational novel told in alternating perspectives between Quinn, the pregnant wife of a war vet with PTSD who has gone missing, and Libby, a teen who is finding her place in the world. It explores themes of the families you choose and the homes you create. 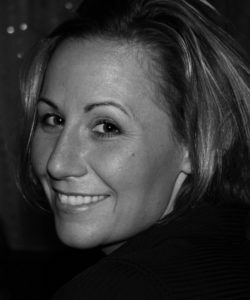 Lisa Duffy received her MFA in creative writing from The University of Massachusetts Boston. Her short fiction was nominated for a Pushcart Prize and can be found in The Drum Literary Magazine, So To Speak, The Breakwater Review, Let the Bucket Down and elsewhere. Lisa is the founding editor of ROAR Magazine, a literary magazine supporting women in the arts. She lives in the Boston area with her husband and three children.